The school of the future (sof), which opened in 2006, overlooks parts of Fairmount Park and Parkside Avenue in West Philly. As its name suggests, SOF is a forward-thinking high school. Focusing on technology and innovation, SOF—which was helped along, though not funded, by the Windows-purveying Microsoft Corporation—uses a project-based curriculum instead of the test-centric model common in U.S. public schools. Although the SOF is a part of the Philadelphia School District and not a charter school, its students spend their school years working on long projects that incorporate many academic disciplines, challenging them to use creativity, critical thinking and problem-solving skills. Baltimore, now an assistant principal at SOF, saw what was being offered in the cafeteria and came up with an idea to incorporate fresher, healthier and more local food into the menus, and couple it with nutrition education. He took the plan to the administration, which was very supportive of the idea, and, along with help from local nonprofits the Food Trust and Fair Food, Baltimore devised a plan for the school to begin ordering a portion of its food from local farms. Since the school district runs the food service program for all of its schools, Baltimore needed to get approval and money to implement the program. To expedite this new plan, they decided to start small—the initial program now covers just under $25,000. Furthermore, it will also cover four schools in addition to SOF. University City, Overbrook, Central and Girl’s High will adopt this innovative plan based on three factors: location, interest and appropriate kitchen facilities. The Philadelphia-based local food wholesaler Common Market—created with a grant from the Pennsylvania Department of Agriculture—was chosen to provide the fare, and classes were set up to teach food service managers about the new options. Managers learned about seasonality of local foods, how to incorporate them into their menus and how to prepare a fresh spinach salad. “The food service managers saw all the great local produce available and were really excited,” says Deb Bentzel, the Farm to Institution manager for Fair Food, which partnered in the effort. For most of these institutions, the program will begin this fall, but SOF was fortunate enough to taste local kale, lettuce and strawberries this past spring. Schools will be allowed some leeway in what they can order; although the money is split between the five institutions and must last the entire year, under this plan, they will have access to produce like potatoes, nectarines, peaches and broccoli. In other ways, the food in Philly’s schools is just like the rest of the country’s. According to a menu from the Food Services website, the daily fare—similar to most public schools in America—is fast, easy and very unhealthy: stuffed crust pizza, turkey hoagies and nachos grande with beef. One day’s meal may contain up to 1,604 mg of sodium, over half the recommended daily value for a fit adult. Another day’s consists of 26 grams of fat, around a third of a daily value for an adult, and 10 grams of saturated fat, half an adult’s recommended value. A handful of the food items on school menus are the beloved foods of Philadelphia: hoagies, cheese steaks and pizza. The problem is a lack of healthy alternatives. However, working in the confines of the current food system, processed foods are cheap and plentiful, and schools have only limited funds. In places like Philadelphia, where most meals are subsidized, schools receive $2.57 for a free lunch, $2.17 for a reduced-price meal and 24 cents for paid meals. That money goes towards the entire cost of food production, including equipment, staff salaries and the food itself. “Many schools have less than 70 cents for food [per meal],” says Tegan Hagy, who runs the Food Trust’s Farm-to-School Program in the mid-Atlantic region. Baltimore and his colleagues, with the approval of the district, are challenging the status quo. As a result, students at the selected Philadelphia schools will have a chance to eat healthier options this year. Next year, if the program succeeds as expected, perhaps all students at Philly schools may get the same chance. There are other groups in Philly, such as the Urban Nutrition Initiative (UNI) and the Food Trust, that have been working for years to improve nutrition in the city’s schools and share Baltimore’s desire to raise healthier kids. UNI manages programs at several schools that teach students about eating, cooking and growing healthy food. The Food Trust additionally organizes food and agriculture programs in some Philly schools, and advocates for food reform and set-up of the network of farmers’ markets in Philly. There have been successes to show for their efforts. In 2004, the Philadelphia Coalition for Healthy Children, which was partly organized by the Food Trust, advocated for and enacted a tough beverage policy that banned juices with less than 100 percent juice content, and any beverages with artificial sweeteners from Philly schools. The Coalition used an action network of parents and activists, and creative visuals like jars full of sugar to illustrate what goes into many popular sodas and drinks. Recently, they have also noted an increase in interest in better food at Philly’s schools. “I get calls from parents every week about doing something about school food,” says Hagy. The School of the Future has started a small garden, and Baltimore hopes to get a one-acre parcel of land from Fairmount Park to turn into a greenhouse and urban farm. “Changing the food is only the start,” insists Baltimore. “We want to fold healthy eating into the curriculum.” With help from UNI, SOF is also making nutrition part of the school’s project system. Students will be able to study life science by planning and working in the garden, use math skills in studying the nutritional contents of different foods and social skills by teaching fellow students how to cook. They are planning on growing produce like cucumbers, tomatoes, basil, pears and apples. 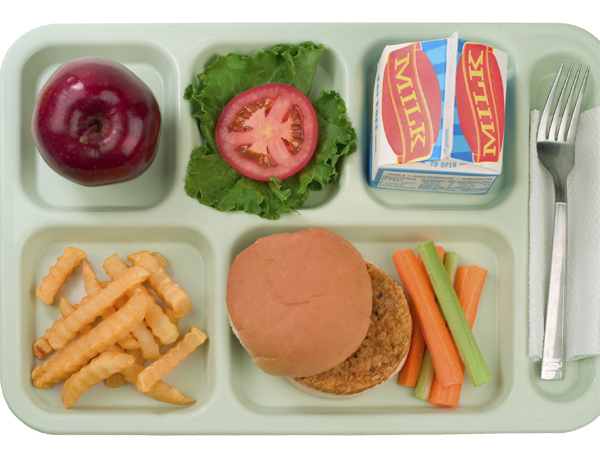 Public schools are tied into the USDA commodities program, where the government takes food from all across the country, sets prices and makes it available to schools (and partially subsidizes the purchases). “The commodities program was originally a way of making prices affordable, but it has got to the point where the quality is poor and schools don’t get much choice,” says Bentzel. Getting a local school to adopt a set of local buying practices is a good start, although the pilot program debuting at the five high schools in Philly this year is using extra money set aside for this purpose (not the general funding schools get for lunches). In order for schools to switch to healthier—and local—produce, something needs to change at a level far higher than the local school board. This year, the Child Nutrition Act is up for renewal in Congress. The act, which governs the school breakfast program and helps set standards for nutrition, has enormous sway over what kinds of foods go into the schools. It will be reauthorized this September and, if it is given the necessary funding and directives, it could allow schools all around the country to utilize healthy, local produce.